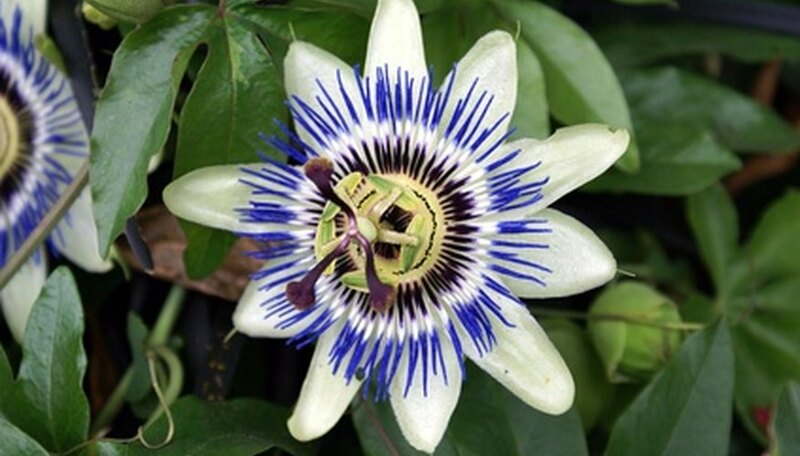 Can a Passion Flower Be Harmful? Passion flower is a flowering and fruiting vine, known botanically by the genus name Passiflora, and also commonly as passion fruit. According to the USDA, there are more than 50 official species of the plant, with numerous cultivars within the species groups. Passion flower has a vining and climbing growth habit, using tendrils, and has evergreen leaves when grown in temperate and warm climes. Look for the placement of the green leaves on the vines. Passion flower leaves are not paired on the vine but will be alternate. When a leaf appears on one side of the vine it will not have a leaf directly opposite on the other side. Inspect the shape of the leaf. Passion Flower leaves will be deeply loped, with finger-like projections in groups of either three or five, depending on the species or cultivar. The lobes are generally oblong or pointedly oval and can range from three to eight inches in length along their central axis. Observe and feel the edge of the leaves. Passion flower leaves will be finely serrated. While not sharp per se, the teeth can be seen and felt. Check for differentiation in the surface texture between the top and bottom of the leaf. Passion flower leaves will be an even dark to mid-tone green and shiny on the top, with a dull surface in green or green with another color on the bottom. The low-growing, prickly foliage is grey-green. The fruit hangs low to the ground and falls off the plant when ripe. The passion berry plant grows in rocky or gravelly soil. Also known as “bush tomato,” Solanum cleistogamum is a fast-growing shrub that fruits heavily after soaking rains. The marble-sized yellow fruits taste similar to bananas. They are a favorite food of desert birds and reptiles. Small, lilac-like flowers appear in late summer or early autumn. Passion berry plants are a primary food source for emus, a large desert-dwelling bird. Emus eat the seeds and pass them undigested in their dung, ensuring the passion berry’s survival. Feral goats, cows, horses and camels, however, fully digest the seeds, preventing propagation. The Passaflora family has more than 500 species and is native to every continent except Antarctica. The well-known edible fruit comes from P. edulis and is native to Brazil, Paraguay and Argentina. Most Passiflora such as P. edulis are vines that climb using tendrils. A few species are more bush-shaped. The unique flowers give this plant its name. They resemble the crown of thorns worn by Jesus during the crucifixion. His suffering on the cross is called the Passion. Most edible passion-fruit berries come from the purple or yellow passion-fruit vine. A few species produce less widely known but still edible fruits. Only some passion flowers are self-fertile; most require a large bee like the carpenter bee to pollinate them. Smaller honey bees are less efficient. 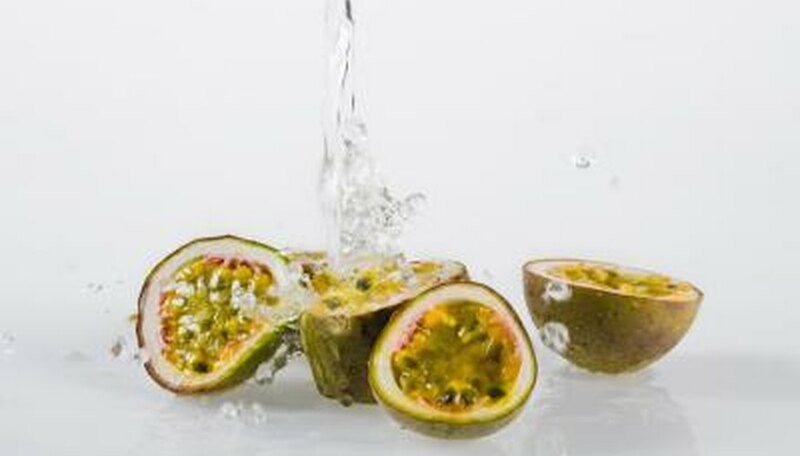 Soak your passion fruit seed in warm water for an hour before planting. You want the water to be warm, but not scalding. This step helps jump start the germination process. Prepare the soil in your garden or a pot to accommodate your passion fruit vines. The soil needs to have a sandy texture as well as plenty of organic matter in order to create the proper environment for your seeds. Water the soil beforehand to ensure that it drains well, as passion fruit plant cannot survive in soggy soil. Bury your passion fruit seeds to a depth of about half an inch into the soil, and water them. Use a spray bottle with a mist setting for the first few times you water to ensure that the seeds are not uncovered by a heavy stream of water. Continue to water the seedlings on a regular basis to keep the soil moist at all times. Wait until the passion flower vine produces fruit in late summer. The fruit will be oval-shaped and 1-1/2 to 3 inches in length and will have a smooth, waxy covering. Harvest the fruit when it's completely ripe and nearly ready to fall from the vine. Slice the passion flower fruit in half with a sharp knife. The rind will be tough. Scrape out the seeds and pulp with a spoon and place them in a fine sieve. Each fruit can have up to 250 small, round black or brown seeds. Rinse the passion flower seeds with warm running water, removing as much pulp as possible. Cover a tray or a baking sheet with waxed paper and spread the seeds on the tray. Place the passion flower seeds outdoors in a shady spot and allow the seeds to dry completely. When the seeds are dry, they will be hard and brittle. Store the passion flower seeds in a paper envelope. Label the envelope and place it in a cool, dark well-ventilated spot until spring. Use clean, sharp shears to prune your passion flower vine early in the spring after new growth has begun. Remove any dead, damaged or diseased material. Cut each stem all the way back to the point it’s growing from. Cut back excessively long or shaggy vining stems that you find unattractive. Prune frost- or winter-damaged stems back to 1 to 2 feet tall. Make your cuts just above a bud or side shoot if possible. This will encourage the plant to produce copious new growth, which will bloom for you in a year or two. Cut all stems of older or excessively overgrown passion plants back to about 8 to 12 inches tall. It’s an excellent way to rejuvenate and invigorate them. This will also encourage thin or leggy plants to produce fuller growth. According to Passiflora Online, all parts of the passion flower vine contain cyanide. As the fruit matures, quantities of cyanide drop in the fruit to the point where it can be eaten safely. As a rule, consider all parts of the plant, with the exception of the ripe fruit, as being toxic.